A poll was released this month that may (or may not) surprise some people: half of sports fans believe that games are influenced by supernatural powers. This belief ranges from the idea that prayers help a team win to the belief that some teams are cursed. God is viewed by many to even intervene on individual plays if you are looking for a divine hand in that Hail Mary pass. The poll by the Public Religion Research Institute found that the greatest belief in divine intervention is found among football fans. 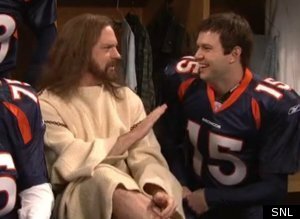 Of course, Tebow and other players have made religious displays part of their game even though God did not carry the ball through the playoffs for the players. That is not the point however according to the hilarious skit on Saturday Night Live with Tebow. Some of the supernatural displays are all to familiar for those (among the 60 percent of Americans) who support a particular team. Some 21 percent (including one in four football fans) will wear special clothes or do special rituals. (Madie and I wear lucky robes for the Bears but there is nothing strange about that!) Some 26 percent pray for the right outcome in a game under the theory that God will reward their faith by throwing the game. That goes up to over 33 percent among football fans. On the darker side, some Donning a team jersey leads the way (66 percent). But some admit they get a little funky with their underwear. One 25 percent believe that their team is simply cursed. (By the way, that percentage goes up to 31 percent for football fans). Now three-quarters of respondents did say that God plays no role in actual wins, but they break down on other questions. For example, 48 percent believe that God does favor particular athletes and gives them more success due to faith. In terms of faith and sports, Evangelical Protestants are the most likely to pray for divine intervention (38 percent) while Catholics (21 percent) and religiously unaffiliated (15 percent) are the least likely. It is a testament to religious faith that seasons do not produce rising numbers of atheists and agnostics. One would think that Steelers territory this year would be one big meeting of American Humanist Association after this season. However, it is the same phenomenon that we discussed with regard to people praying to be spared from hurricane and tornadoes. Faith supports the prayer but the outcome is still “God will” and unknown plan. That appears to apply to the gridiron and other sporting locales. Now it is true that I have often called the Chicago Bears “God’s Team” but that is not some supernatural religious obsession. Everyone knows that. imo, he responds most favorably to such requests if we prepare to the best of our abilities. I.M. HIPP – Honest Abe stated in one of his last speeches, that the level of bloodshed during the civil war, was perhaps due to our nations embrace of slavery, inferring that it was morally wrong and if we changed it all would be well in our Republic. He of course was assassinated soon afterward and of course he had severe psychological problems. Believing that God affects the outcome of sporting events is catamount to believing that God affects the outcomes of tornadoes, mudslides, earthquakes and atrocities like the holocaust. That idea that God allows only the believers to do well in sporting events is typical of various people. They used to believe that we had to sacrifice some people to please the Gods.